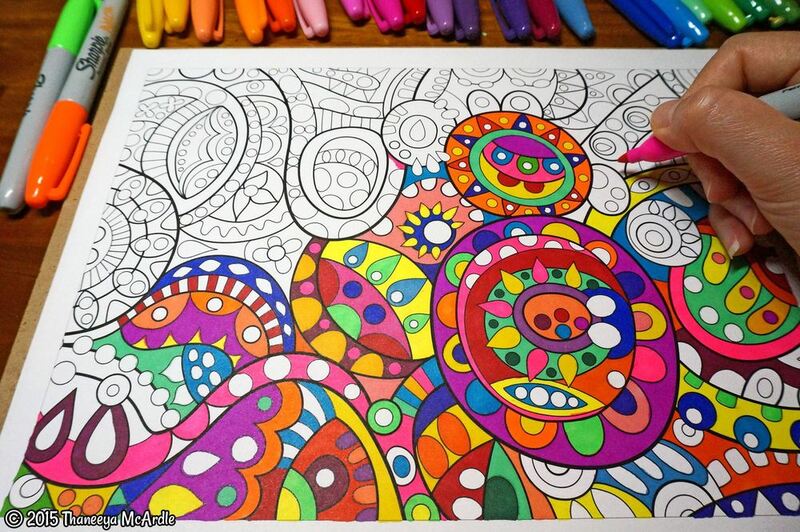 Are you adult enough for an adult colouring book? It’s arguably the biggest new trend of 2015. With spots in Amazon’s Top 100 book list, as well as rave reviews from critics all across North America, adult colouring books are the perfect Christmas gift for the creative person in your life. I couldn’t help myself when I went Christmas shopping the other day. I just had to pick up a copy. Anna Karenina: A Colouring Book Love Story includes images reminiscent of the Elizabethan era, complete with chandeliers, gowns, princesses, and princes. As an English student, this was the book that spoke to me directly. I knew I was about to start something exciting when I found myself grabbing a pack of coloured pencils the same day to start ‘expressing myself’. Plus, at an average cost of $10-$15, they’re actually affordable. I came home that night and sprawled across the living room floor with a cup of tea and my hair in a messy bun, taking the persona of my version of a stereotypical artist. I took out my pencil crayons and hesitantly put a mark on one of the paintings. Surprisingly, it took a lot of effort and concentration to fill in the red lipstick I wanted the woman in the drawing to be wearing. The drawings are done in a rather intricate way and is definitely not meant for children (despite what some people may say!). I found the process rather calming, as I deliberately thought out which colour would look good in which area of the drawing. I was careful not to go past the lines- as difficult as that was -and did my best to make my work look artistic. In the hour and fifteen minutes that I spent behind this colouring book, I not only recalled my childhood, but I was distracted from my technology. I also confirmed a lot I knew about myself — I am a perfectionist with the attention span of a three year old. Despite not having any professional background or experience in fine arts, the effort I put behind my artistic piece(s) would lead anyone to believe I was prepared to release them in an art gallery. I expressed utter disappointment when my colouring tactics were looking less than par, and put a little too much thought into each colour. Because let’s face it, what difference is there between a light green leaf and a dark green leaf? I went back to each flaw and tried fixing them using blending techniques and filling them in more deeply, thinking I could obtain the artistic abilities of Picasso in a matter of one hour — without natural talent, an instructor, or thousands of dollars of tuition. I used my fashion sense to try and colour bloc flowers and patterns. The precision and perfection that these books encourage was definitely a huge barrier for me. I started more then five drawings without completing a single one. I can’t say that I’ll go back to finishing them either. I learned that the expectation of perfection is the first thing you have to let go of. Letting things flow naturally is the only way to acquire the therapeutic feeling that is said to come out of these colouring books. Because in the end, the result of my hard work and precision was a flower on one page, a sun and sky on another page, and half a lady on yet another page. Since my full fledged art session, I’ve only gone back to my colouring book a few times more. The pages are rather overwhelming for the average person, although the drawings do help create a sense of direction. I mean, let’s face it – I would never purchase a sketch book for myself and expect to freestyle. A colouring book, however, seems like the perfect activity for when you have a lot on your mind and would just like to relieve some stress. As my exam season winds down and my family and friends have started to come out of hibernation for the holidays, I am no longer as interested in my book as I was when I purchased it in the midst of deadlines and exam schedules. Maybe it’s just me, or maybe it’s another aspect of #studentlife. After trying our these adult colouring books, I came up with the following conclusion: Maybe I just don’t qualify as an adult yet. However, I do not regret my purchase. It’s aesthetically pleasing and helps keep you away from your phone for at least 20 minutes. But, if you don’t Snapchat your progress, are you even colouring? Besides, colouring is not something I would usually take up as a hobby, so the thrill of trying something new is rather refreshing in the midst of my mundane routines. I’ve decided to take this project up as an opportunity to let go of my perfectionist ways and just let the drawings be what they’ll end up being. If that means colouring a horse pink, then so be it! Quick tip: avoid googling finished adult colouring book images, because you’ll most certainly be disheartened at your lack of colouring abilities. Despite this, I did come across some drawings that I will eventually want to colour (to its full potential) because of the sheer gorgeousness that the artist has captured using mere ink. The overall verdict: give in and purchase yourself and/or your loved one a copy. It’s a fun way to do something childish while still being an adult. Plus it’s trendy, so why not?